Rhodes is an island full of natural beauty and famous for its archaeological sites and museums. UNESCO proclaimed it's Medieval City; a monument of global cultural heritage. Today despite the 7000 years of turbulent history, the magnificent monuments are still standing with great antiquity. The island of Rhodes has endless options for entertainment, and it is particularly famous for its nightlife. There are plenty of choices for things to do, from exclusive restaurants to elegant cafeterias, nightclubs, pubs, bars, trendy discos, live music halls, sushi and cocktail bars. Rhodes is the island to be on 'spoilt for choice' with countless entertainment options. Rhodes offers a wide variety of excursions to entice everyone. Culture lovers may visit the island's numerous archaeological sites, those interested in nature may visit unique natural attractions either by coach or for the more adventurous, driving a 4x4 jeep in a guided safari! Sports enthusiasts may try scuba diving or snorkelling at some of the most popular beaches. Local food lovers may taste Greek cuisine and local wine at the evening village party, or visit a winery and see the production line in reality! Those interested to explore the local life may visit small traditional villages on the island tour. Alternatively, you may visit the nearby island of Symi, Halki, Kastelorizo or even take the opportunity to visit neighbouring Turkey. The windy season starts from April till October with peak season when the Meltemi winds blow in July, August, and half September, the wind will blow 6-7 days a week. West-north/westerly direction offers the ideal side-side onshore condition from the left. The wind is usually lighter in the early morning; 12-15 knots ideal for lessons, picking up at about 13:00 and continuously blows into the sunset. The wind range is 14-25 knots, most of the guys will be on 9m-12m kites and the girls on 7m-10m kites. The weather is comfortable all season long, with average air temperature 20-30 degrees and water temperature 16-26 degrees. Rhodes has a huge selection of rental cars, scooters, motorbikes, bicycles at affordable prices and it's the best option to move around. Taxis are also a good and cheap option. Some Buses run all day long to all the directions from Rhodes town. Once you are in the village, everything is within walking distance, so it's perfect! Rhodes has many restaurants, traditional taverns, sushi bars, international cuisine and of course, plenty of souvlaki and pita gyros places. Eating out in Theologos is worth it, many locals visit the village only to enjoy a meal at the traditional taverns. You can have a full meal of several greek snacks and drinks for only 10€ per person. The average prices you will be paying while eating out are 10€ for a meal, 4€ a beer, 7€ for cocktails and 2.5€ for a pita gyro. You'll love partying in Rhodes! The wild parties are on bar street in Rhodes town and Faliraki which is 15km from the town. You'll have amazing drinks and beautiful sights of the medieval town of Rhodes you can find several cocktails, rock, latin bars. For clubbing, Rhodes also has a couple of really big summer clubs where they often host famous DJs from around the world. Many options of archaeological sights to visit, over 40 different beaches, one of the biggest water parks in Europe, several day trips to small islands like Symi, Chalki, Kastelorizo or Turkey Marmaris. Wet Skillz organises several no-wind activities including; rock climbing, scuba diving, SUP tours, jeep safaris and yoga classes. You'll find everything you are looking for from luxury private villas and big resorts to self-catering apartments and for all affordable options near the spot. One of the best locations for kiters is the Wet Skillz guesthouse which is right in front on the place, 50m from the water! Petros is half Finnish and half Greek. Born and raised in Rhodes he knows every inch of the island and all its secrets! In 2010, Petros fell in love with kitesurfing and few years later he decided to become a kitesurf instructor and to open his own kite school. He likes to share his knowledge and to motivate people about kitesurfing. The perfect conditions for him are strong winds, small kite and riding the waves strapless with his directional board! Been to Rhodes? What did you think? 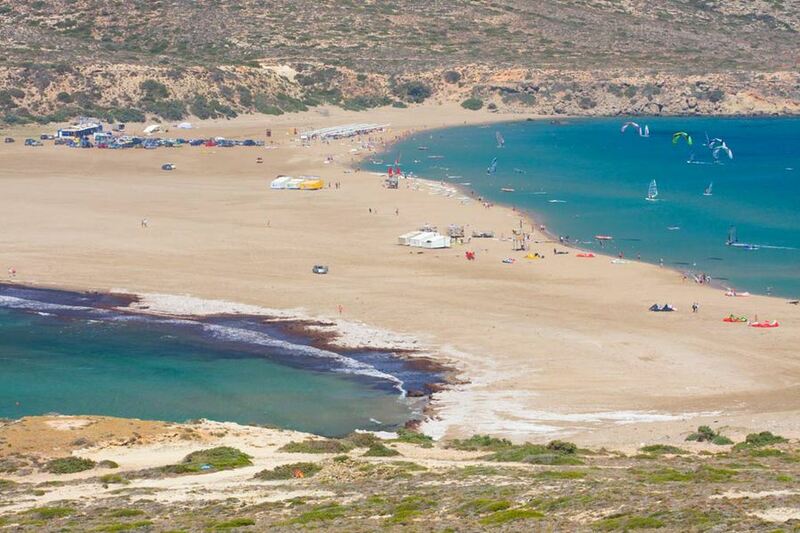 Where are the Best Kitesurfing Beaches in Rhodes? Theologos beach is the best place to ride and learn about the island. The huge coastline, not crowded, not a lot of other users besides kiters. Clear warm water, quite flat at the beginning of the day when the wind is lighter and later on the day small waves close to the beach, and it gets a little choppy. Prasonisi is the most popular spot in Rhodes because of the two different water conditions in one place. One side onshore wind and waves and on the other side-offshore wind and flat butter water. Prasonisi has the best riding conditions of the island, but it's not for everybody. It’s super crowded which makes it difficult for beginners; onshore side makes it a bit tricky to go in especially if there are big waves. Kite beach is the most popular spot and enjoys a good mix of flatter water and waves on the reef. When it gets windy, it can get choppy on the inside, and during peak times it can get busy. Hold off for an evening session or get out during lunchtime to avoid the masses. When is the Best Time to go Kitesurfing in Rhodes?